I’ve received a great contribution from long-time reader, contributor and top local history operative John Daft. John, who has been involved with so many local history articles on The Brownhills Blog, has again come up trumps with some local history gold. 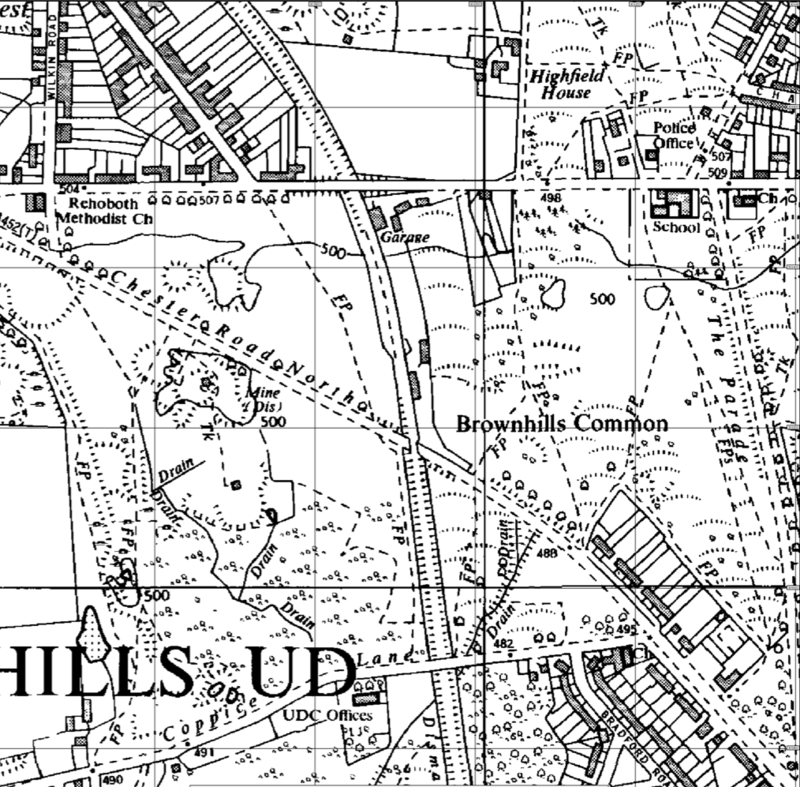 I’m trying to find out when the railway bridge that used to cross the Chester Road North, Brownhills, just past the Hussey Arms was demolished. If anyone knows I would be very grateful as I have done many a search over the internet but haven’t found what year the bridge was demolished. Well, I responded with what I knew – courtesy mainly of the excellent Robert Webster site. The Railway was not a good profit making business as far as carrying passengers was concerned as the Station was half a mile outside the Town with the South Staffordshire Railway Station being directly at the top of the High Street. This lead to the trains mainly carrying miners to and from the pits. The Loss making line was eventually closed to passenger traffic in 1930. It continued with limited use until 1960 carrying minerals when it closed to all traffic. The track from Chasewater to Walsall Wood was removed and the Bridges also were demolished. Some of the Bridge Parapets still remain and the Blue Bricks of Freakley and Sons which were used throughout the construction of the Track can still be seen. 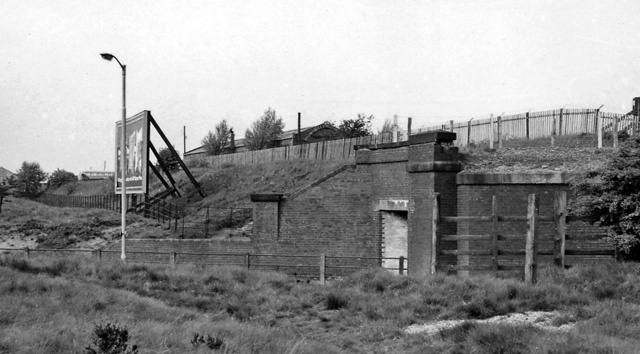 As with Brownhills ‘Watling Street’ station – the only other passenger station on the branch – Walsall Wood was closed in 1930 and in 1960 the track north of the station site was lifted as the collieries began to disappear with the rest of the line to Aldridge being lifted at the time of Aldridge’s demise in 1965. So I’d say they probably went in the early sixties. Anyone know for sure? Picture supplied by John Daft - not sure of the provenance. I’ve had a message from Paul Bradley, by way of you, I believe. Thank you. I’m attaching (if my memory lets me!) a photo of the Midland Bridge on the Chester Road. It is said to be looking north-eastward – I take that to mean the photo was taken from the Rising Sun side of the bridge. Taken before 1962. I’ve shown it to our friend the oakparkrunner and he says that Ralph Ferrie was going to build a transport museum on that site but doesn’t remember a building ever being built. I wonder if you or any of your readers could throw any light on it. It certainly looks like the Midland Bridge but I suppose we could be wrong! I’d say there’s no doubt that that is the bridge in question. Although almost all of the remains of it are now gone, I remember the structure still extant without the deck for some years; a pedestrian tunnel was strangely constructed separately from the main roadway arch and remained intact for years. The footpath was divided from the Chester Road by the railings that can be seen in this picture, and sat somewhat lower than the roadway. These were on the far side of the road; the main road portion is obscured in this photo by the abutment in the foreground. It’s an odd angle, and as John says, I’m sure it was taken standing on the Southern side of the Chester road, on the Rising Sun side of the line. The buildings of the former station can be seen beyond the fence just left of that hoarding, which I recall being in place in the late seventies. I can remember walking past it with my dad, sometime around 1977 when it carried an advert for ‘Double Diamond’ beer.. The street light looks relatively modern, so the picture (which is also surprisingly good for the subject matter – perhaps this was just pre-demolition?) must be quite late. 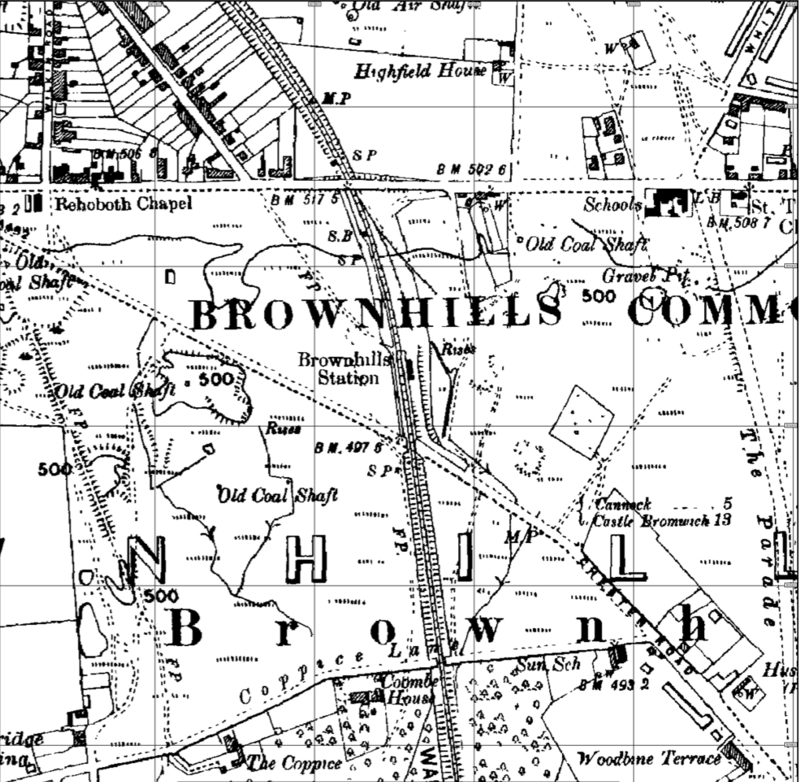 1938 1:10560 mapping of the line crossing Brownhills Common. Click the map for a larger version. Notice the station north of the Chester road, and the sidings to the south east of the under bridge at Watling Street. Note also the profusion of old coal shafts. Coombe House is still next to The Coppice, but notice the Rehoboth Chapel to the west – later destroyed by the Rising Sun island. In case you’re wondering, ‘Rise’ in this context is a spring. 1966 1:10560 map of the same area. Click the map for a larger version. By 1966, the line had been lifted. Maps of this period often exhibit several years lag, so one can say this was anytime from 1962 to 1966. The bridge over Coppice Lane had already been removed – although one of it’s abutments remains today, with the adjacent Coombe House becoming ‘UDC offices’, The Coppice having seemingly been demolished. The bridge over the Chester Road is still there, as, apparently are the former station buildings. I note also the strange appearance of a garage up where the sidings were. This appears and disappears over the course of less than a decade, and I wonder if it was connected to the Ferrie empire. I believe the gate to it still exists. Other things to note are the appearance of the Hussey Estate, the Police Office at the bottom of Whitehorse Road and Highfield House not yet becoming Highfield Farm. I’m interested in what appears to be a small, square building south of the disused mine centre left; it’s liked to the former mine by a track. The area of the bridge today can be seen on Google streetview and little remains except the blue brick retaining wall and the odd low level of the footpath, both original features. Note that the streetlight is still in the same position over four decades later. So, I’m throwing it open to the readers. If anyone has anything to add to this, I’d be only too pleased to hear it. [Oakparkrunner] has created a lovely walkthrough of this line over on his blog. As an aside, does anyone else remember the Vigo Road bridge being called ‘The Rabbit Bridge’? Anyone know why it was so named? This entry was posted in Brownhills stuff, Environment, Followups, Fun stuff to see and do, Interesting photos, Just plain daft, Local History, Local media, Panoramio photo discussions, Reader enquiries, Shared media, Shared memories, Walsall Wood stuff and tagged Brownhills, Brownhills common, Brownhills local history, Brownhills railways, Brownhills West, brownhills West Station, Coombe House, Derelict, John Daft, local blogs, Local History, Midland Railway, New Photos, Oakparkrunner, Old maps, Rabbit Bridge, Staffordshire, Walsall Wood. Bookmark the permalink. Thanks a lot Bob, well done. I moved to Brownhills in 1967, and I’m sure the bridge still spanned the road then, I reckon about 1968, I remember my father saying that the road had been closed to demolish the bridge. bob.i seem to recall brownhills motor sales garage was on the a5 between watling street school and the crown island.i think there was a steep driveway down off the a5. my brother worked for the ferrie brothers at this site when he left school. they later moved to what is the bussiness park on linden road walsall wood..
We went to the first Championship at Banbury in 1961. (in fact i only gave my medal away about 9 years ago to a young man i met who built himself a go cart out of an old lawn mower and some really heavy steel . Never would have raced much to heavy for the engine, but he didn’t know about engine to weight ratios,deserved something for the effort) I was bought up in Pear Tree Lane (by The Pear Tree Cottage) Brownhills West. Have great memories as a child. Further to the reference made about Ralph Ferrie and go-carting. Did you know that Ralph actually came third in the British Championships back in the 1960’s. Shortly afterwards he retired from racing, Steve Thompson from the Thompson car sales garage in Walsall had his old carts. Ralph then got a speed boat and started using Chasewater reservoir. Does anyone remember the Amphi-car he bought and used on the water? It was in the early 1960’s and I think it was blue and cream. my brother used to work at brownhills motor sales when they were agents for leyland,albion,scammell and guy. it was located on the A5 between Watling street junior and infants school and the Rising Sun island. (opposite the slip road into chasawater). i seem to remember the entrance was down a rather steep slip road. anyone else remember it ???? I left school (W.R.Wheway) in 1962/3 & started my 1st.job at Brownhills Motor Sales. The property straddled between the Chester Road. (A452) & Watling St. (A5) & was, as I remember the Old Station Yard. There was (starting from the Chester Road side) the paint shop, stores, main workshop, heading over towards the A5. another small stores, a large body shop, ” Bert’s workshop” opposite that (where I worked), the offices & reception & finally onto the petrol pumps. Which was a FINA garage. The yard was eventually disbanded & re-located to Lindon Road. I remember the amphicar, Ralph showed it at the staffordshire county show, yes a larger than life character with an eye for the ladies on foreign shores. I worked for Brownhills Motor Sales from about August 1955 for one year. Most of the time I worked at what I understand was an old bus or tram depot behind the Station Hotel. It was an interesting time in my life. Another of the Ferrie family came to work with us for a spell, I forget his name. Bert Pearson was one of the characters who worked with us for a spell, there was also an Irish man called Jim Redmond who was a brilliant mechanic. I remember the plant between the A5 and the Chester Road very well. Brown hills Motor Sales had at the franchise for Volkswagen for a short while and I remember the new vehicles coming in as well as chassis from Leland and Albion. The company pioneered the use of aluminium to build cattle trucks etc.